Nice sunny day, nice blue sky. Yesterday, Washington DC kind of reminded me of this place. But I'm done talking about old stuff. Gonzaga and Archbishop Carroll played a rare Monday high school football game that was postponed because of the terrible weather this past weekend. On paper, I don't know if Carroll was supposed to be in the game as long as they were (14-13 Gonzaga in the 3rd quarter). 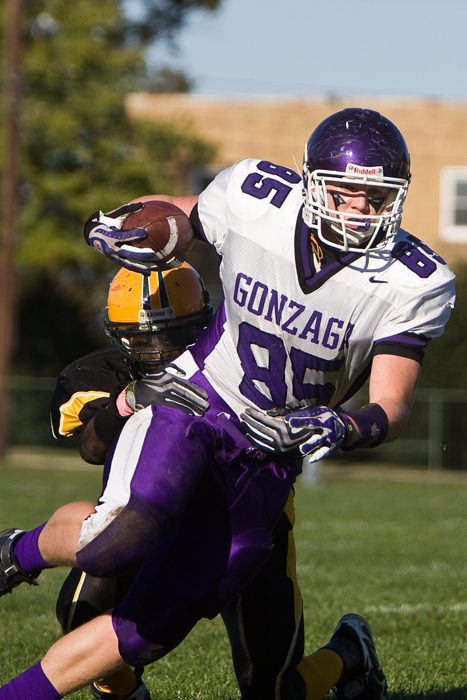 Eventually, Gonzaga pulled away and went home with the 34-14 victory. Shout out to tight ends. I've never played quarterback (well I've never even played organized football) but it seems like there is no target like a big target.